Zucchini, baby marrow or courgettes can be cooked, eaten raw, baked, stir fried or pureed. I previously had tried just zucchini soup and it didn’t turn out that great. The end result was a pale colour soup and hardly any taste. However, next time round added a few more ingredients to make the colour and taste more appealing. The soup turned out just fine. What really beckons us to eat something besides the aroma is the colour. The eyes love what it sees and sends hunger signals to the brain. Anyway hope you like this recipe. Heat 2 tbsps of olive oil in a pan over medium heat. Add onion and garlic and saute till the onion becomes soft. Add potato and zucchini and saute for 2 to 3 minutes. Cover the pan and let the vegetables cook for 5 minutes. Add the water and cook further if the potato is not done. Take the pan off the heat. Let the mixture cool a bit. Add spinach and half of the coriander. Mix well. Puree the vegetables. Put the puree into a pan and bring it to a gentle boil. Mince the remaining coriander and chilli in a herb mill. Take the minced mixture out in a small bowl. 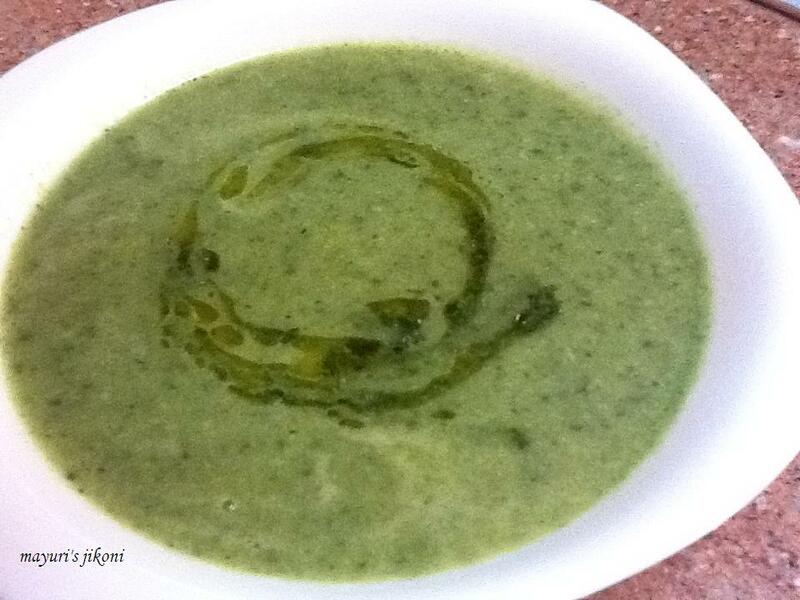 Just before serving, drizzle the coriander olive oil over the soup. Serve the soup with extra lemon wedges. Can omit the chilli if you don’t like hot food. Can serve the soup with croutons or grated cheese. Taste the zucchini before chopping as sometimes they can be bitter. For a more creamier soup add fresh cream. Whoops! My bad and I see you have !! Cheers and thanks for that! !